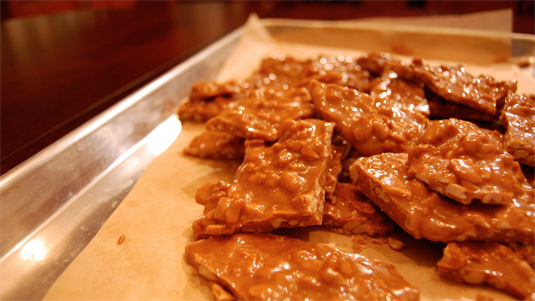 As I awaited Irene's overnight visit this Saturday, I decided to keep myself busy with a new challenge - Peanut Brittle. Considering my candy thermometer is tucked away in a storage facility I am not sure why I thought this was in intelligent time to venture into the world of sugar boiling, but miraculously I was able to gauge the appropriate time and temperature with the help a meat thermometer (please note the thermometer's highest temperature was 75 degrees colder than the maximum temperature suggested in the recipe, plus I halved the recipe so all times were significantly shortened - there was some serious guess work going on). One part estimation to two parts dumb luck seems the perfect recipe for success... next time I'll unpack my thermometer to be safe though. But I didn't stop there. 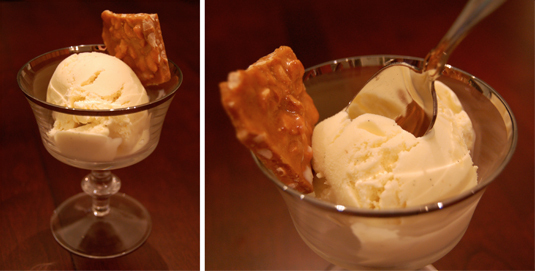 What would go well with the crispy, salty-sweet treat? Cold and creamy vanilla ice cream of course! I made a basic custard compliments of David Lebowitz, froze the concoction and voila, a perfect post hurricane dessert for Sunday. I don't know what it is about bananas, one day they're not ripe enough to enjoy then the next they're a spotted mess. I can't complain though because the surplus of blackened fruit makes for whole host of baking opportunities. 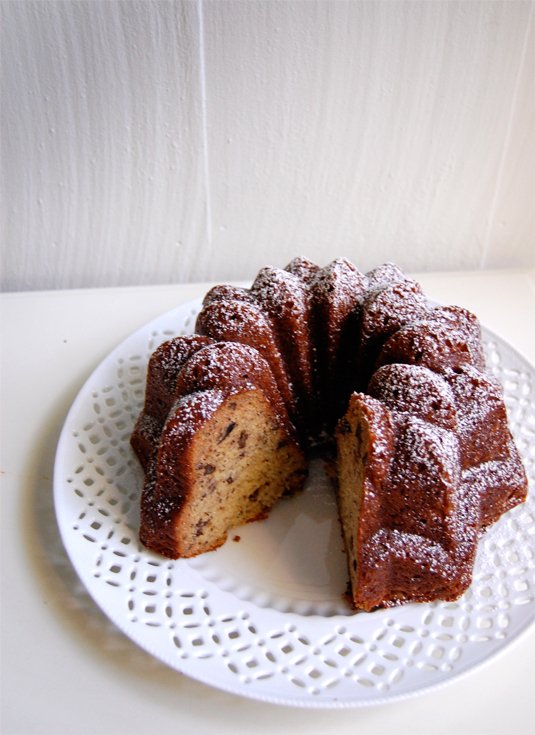 Last week's crop of past-prime bananas ended up in this basic Banana Bundt Cake. No fancy icing, chocolate chips or lemon zest, this recipe made sure that the banana flavor was front and center, the texture was a nice tight crumb and each slice was light and super moist. I may have added the chopped pecans as a little surprise but this recipe needed no helping. My search for the perfect banana bread, one with big flavor but not as heavy as a brick, may be a wasted effort because this banana cake blows any bread I've had out of the water. Perfect for brunch or late night with a cup of tea, next time your fruit bowl is burdened with stinky, black bananas this is a must bake - trust me. Center rack in oven and preheat to 350 degrees F. Grease a standard 12-cup bundt pan. Whisk flour, baking soda and salt together, set aside. With stand mixer or hand mixer, beat butter in a large bowl until creamy. Add the sugar and beat on medium speed until light and fluffy. Beat in vanilla, then add the eggs one at a time, beating about 1 minute after each egg. Reduce the mixer speed to low and mix in the bananas. Finally, mix in half of the dry ingredients (batter may look curdled), and all of the yogurt, then the rest of the flour mixture. This is when you add the nuts if using. Spoon the batter into the pan and rap on the counter to de-bubble and smooth the top. Bake the bundt for 65-75 minutes or until a thin knife inserted deep into center come out clean. Check the cake after 30 minutes - if it is browning too quickly cover loosely with a foil tent (I know my bundt needed the tent, I would suggest doing so as well). Transfer cake to rack and cool for 10 minutes before unmolding. Cool to room temperature. Tip - wrap up cooled cake in plastic and wait a day before enjoying. Time is this cake's friend, the flavors intensify and the inside gets super moist. Having guests over on a Sunday afternoon? Have a brunch! This past Sunday I hosted my first mini brunch. I was very excited and wanted to try some new recipes. My menu consisted of mimosas, easy sticky buns, fresh fruit and country French omelets. Obviously you need to start the day off with some cocktails! We had mimosas. I added a new twist to them. I did not use oranges but instead this amazing new fruit I recently discovered. The tangelo! It is a hybrid between a tangerine and either a pomelo or a grapefruit. It is so much juicier than an orange and I personally think it is much tastier. You should try one! I juiced about 12 tangelos and mixed it with prosecco. a lot earlier then they tell me to. Obviously you have to have an egg dish to make your brunch complete. Yet again I used another Ina recipe. I made this my own by adding onion and some sharp cheddar cheese. I must say this dish made up for my failure with the sticky buns. To make this omelet truly special I used really good apple smoked bacon. On another note I would not call this an omelet. It is actually baked in the oven so I would call it a frittata. However you choose to classify this dish, it is truly delish! In the words of my father, "Chocolate and nuts, of course they're good." Biscotti have gotten the unjust reputation of being a treat only purchased at the coffee shop register, not baked from scratch in your own kitchen. I'm here to amend the misconception... it is easy to make biscotti. Your morning cup-o-joe and afternoon mug of tea will thank you. Yes, you do need to bake them twice, however those of you skeptics who have sliced and baked a toll house tube of dough should be old pros. The easy batter is shaped into flattened logs, plopped onto a parchment-lined cookie sheet and baked for 25 minutes. After a 20 minute rest to cool down, you slice and space the cookies, lining them up like an army of Italian soldiers. Back in the oven for 10 minutes to ensure the crusty exterior and you're finished - the perfect dunkable cookie. Laced with chopped bittersweet chocolate, infused with espresso powder and speckled with walnuts, these beauties beat the bland, Starbucks counter offering in both flavor intensity and texture. Note to self, next time make sure these little soldiers put on a coat of dark chocolate before leaving the house. Sift together the flour, sugar, cocoa, coffee powder, baking soda, baking powder, and salt. With a mixer, cream the butter and sugar on medium speed for about 2 minutes until light. Scrape down the sides of the bowl and add the eggs and vanilla; beat for another 2 minutes. Decrease the speed to low and mix in the dry ingredients in 3 additions, mixing only until a dough forms. Scrape down the sides of the bowl and mix in the chopped nuts and chocolate. Turn the dough out onto a work surface and knead a few times just to incorporate any dry ingredients that didn't get mixed in before. Divide into two portions; on the baking sheet, shape each portion into a 12 inch log, then flatten with the palm of your hand so the rectangle is only 1 inch high. Bake for 25 minutes. Remove the sheet from the oven and let it cool on a rack for 20 minutes. Then, with a serrated knife, slice the logs into about 3/4 - 1 inch slices and leave the slices standing up on the baking sheet, making sure they do not touch. Return to the oven for another 10-15 minutes of baking. Transfer biscotti to a rack to cool. Once cool, feel free to make a pool of melted chocolate for the biscotti to take a dunk in. 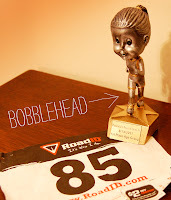 Rain or shine was no lie this past Sunday when I competed in and completed my very first sprint-length triathlon! After a 1/4 mile swim, 10.5 mile bike ride and 3 mile run in a steady down pour I crossed the finish line, still breathing and surprisingly first in my age group. The reward? An awesomely kitschy bobblehead, complete with silver ponytail and bronze nikes. Add in some chocolate biscotti and I'd call that an excellent end to the weekend. What does one do when you have limited counter and storage space in your new rental kitchen? You look for an affordable solution at IKEA. Obviously their furnishings are reasonably priced but not always the most attractive options. We found the GROLAND kitchen island for a pretty good price and it met all our requirements. The only issue was it was very sad looking. However, that did not stop us. All we needed was a bit of wood stain and a can of white paint. I actually had the white paint left over from a previous project and we borrowed the wood stain from a family member. Our island update didn't cost us anything but time. 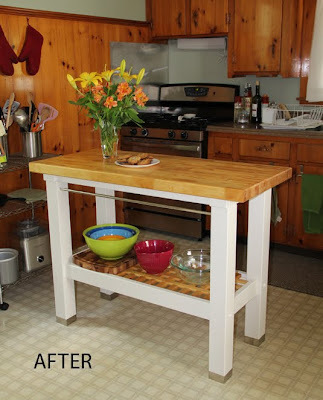 The kitchen island went from Blah to a smashing Ta-Da! It really brightens up the dated wood kitchen and gives us the much needed counter space we have been longing for. What language did you study in high school? My fellow francophile and friend of over 15 years, Jill, joined me for an evening of Parisian treats! 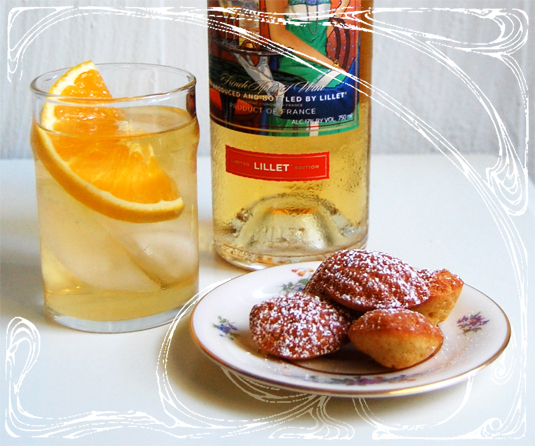 On order were some petit lemon madeleines (my new pan's maiden voyage) and Lillet on ice with orange. For those of you new to Lillet, it is an aperitif wine with hints of citrus. Traditionally served over ice with a slice of orange or lemon, it has a slightly thicker consistency than white wine with a gentle sweetness. My attempt at madeleines was not as daunting of a task as one might assume. To add depth I browned the butter but other than that I kept to the detailed recipe found in Dorie Greenspan's Baking: From My Home to Yours cookbook. The result were dainty, cake like cookies that are a perfect pop-able size, best served along side a cup of tea, coffee or glass of Lillet! The acclimation back into the daily grind is never easy after a low-key week at the beach. As you already know, the Talbot Family Vacation in RI was a smashing success; there were plenty of books read, skin burned and salt water unintetionally ingested. But what is a vacation without a few treats?! So as we loaded up the car with towels, chairs and enough clothing to dress the entire town I made sure there were some sweet (and potent) treats packed as well. 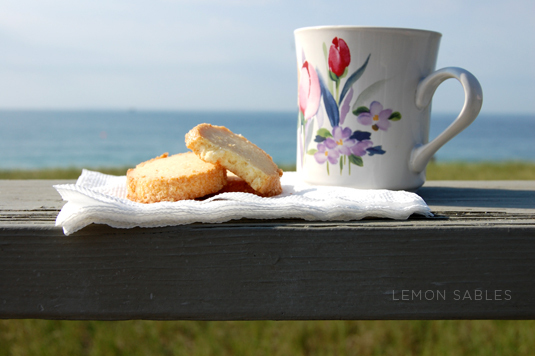 LEMON SABLES: France's version of a sugar cookie, these are delicate and light, perfect with a cup of coffee or tea. Dorie Greenspan (just bought her gigantic Baking cookbook, uhoh!) has an ingenious method of working the zest into the raw sugar with your fingertips to pull out just enough essence of lemon without being over powering. 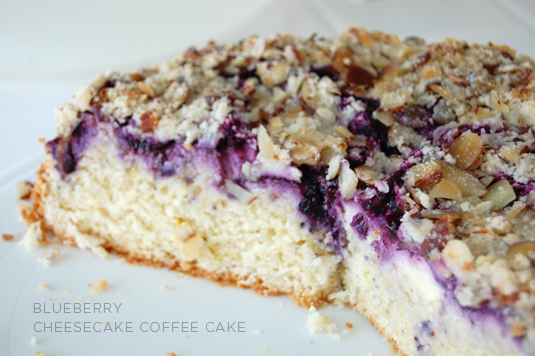 BLUEBERRY CHEESECAKE COFFEE CAKE: I know, the title's a mouthful... and so is this decadent cake! Essentially a coffee cake base toped with cheesecake filling covered in a blueberry compote and finally sprinkled with almond crumb, this treat is both decadent and delicious. The real confusion though is with it being so rich (yet surprisingly not as dense as one would assume), is this a dessert or a breakfast item? Well just eat it twice, problem solved! GIN & TONICS: A Summer Staple. 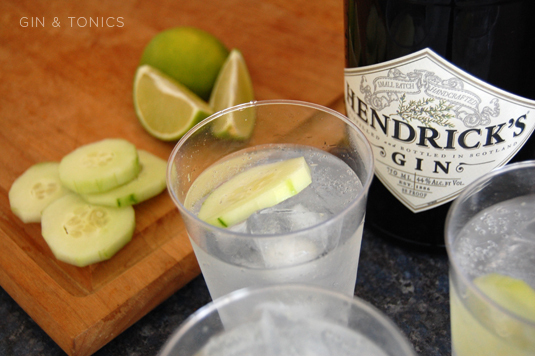 This year we made them with fragrant Hendrick's Gin, a splash of tonic and a slice of cucumber. The perfect pre-lobster dinner cocktail. Is someone making a come back? Guess who this 90's child/teen actor is staring in the new Cee Lo Green music video. I can't help but smile while watching this!